Signature Home Services – The Best (And Sometimes Surprising) Eco-Friendly Kitchen Remodeling! Going green is an idea that’s earned a LOT of talk among homeowners in the last 10 years. When remodeling or designing a home (or any space), there are literally hundreds of ideas to design a greener space…in other words, one that’s not only environmentally-friendly but more economical for your family. 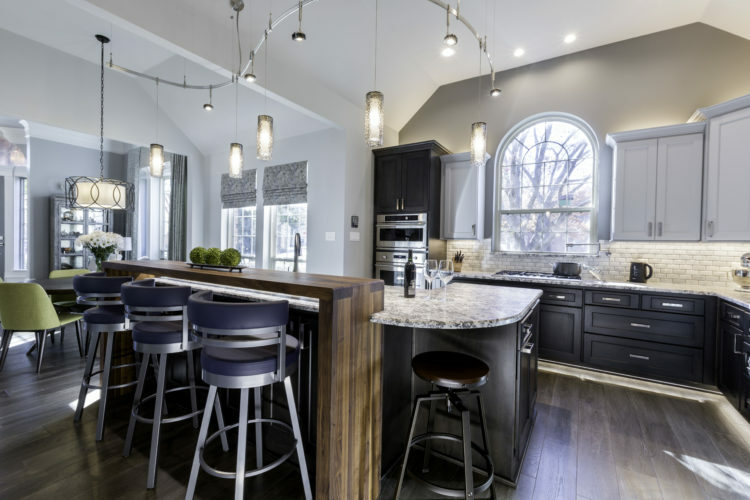 What are the popular eco-friendly kitchen remodeling trends? Popular green kitchen remodel trends include a lot of features you’ve probably heard about, and some you haven’t. Energy-efficient lighting, hands-free faucets, bamboo flooring, recycled countertops, green building products (including marmoleum, natural linoleum, green fiber insulation, salvage butcher blocks, etc.) 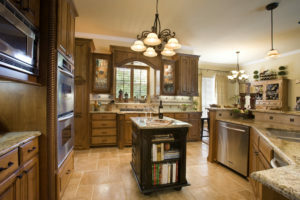 are all trends in play today for a greener kitchen design. And there’s one BIG opportunity that deserves special mention in things-green: so many of us upgrade appliances during a remodel, why not choose an eco-friendly option to reduce energy use? In the long run, it could save you thousands of dollars in electric bills. We’re going to break down some of our favorite recommendations for homeowners who want to “go green” in a kitchen remodel. Some of these can be done in a simple facelift, while others are best during a full remodel. Selecting a countertop made from recycled products gives your kitchen a look unique to your home. Recycled countertops are generally easier to clean, are BOOMING in production because of the rise in demand, and can be made today from recycled glass, marble, tiles, and waterproof recycled paper panels. 2: More to lighting than the eye sees! Good lighting in a kitchen is a MUST no matter the remodel, and it’s also one of the least expensive places to go green. Simple solutions like using energy-efficient light bulbs can save money—just imagine if all the bulbs in your kitchen lasted twice as long! While you can use SEVERAL eco-friendly products for flooring, bamboo has become the most popular green kitchen trend in recent years. Its durability, look, and resistance to stains are popular selling points for many homeowners. It’s also a renewable resource and requires very low maintenance to clean and keep in top condition! 4: Finishes—what are you cooking on? Eco-friendly finishes are another consideration for surfaces in your kitchen, including on cabinetry, floors, countertops and even appliances. Whenever you’re able to pick the specific finish for a product (like on your cabinets), be sure to look for the eco-friendly options. It will be better for the environment and better for your family—unnecessary exposure to toxins is something the green trend is quickly cracking down on. Windows, anyone? Making sure you have enough windows in your kitchen (and that they’re big enough) will ensure proper lighting and will also make ALL the difference with proper ventilation. And with better ventilation, you’ll improve not only the air quality in your home, but you’ll have less gunky build-up on appliances and surfaces over time. Going green with big, beautiful windows actually makes for easier cleaning later! Selecting your appliances is an opportunity not only to save on electricity, but on water consumption. Appliances can also be “greener” when they’re made with environmentally-friendly materials and finishes. If you’re due for an upgrade, why not go green? You’ll save big in the long run. And speaking of water, motion-activated and low-flow faucets are a must for an eco-friendly kitchen. Let’s be honest—you don’t need to wash the dishes with a fire hydrant. Hands-free or sensor faucets also make the list of green kitchen trends because of their overall sleek design…so even your design sense will be proud to have one of these installed in your green kitchen remodel. Last but definitely not least, you can also use natural fabrics all over your kitchen for another eco-friendly boost. On your counter stools, in nook seating and for window coverings, look for a green option for easy maintenance, more breathability, and another chance to avoid adding more chemicals to the kitchen that should never have been there in the first place. Expert tip on window coverings: whether you go for fabric or wood window coverings, there are LOADS of eco-friendly options we share with clients through Graber Blinds. All of these use renewable resources and ditch the toxic finishes, and some of them are even designed to let in that “Goldilocks standard” of light so you can save even more on the electric bill. Have you been thinking about a green kitchen model?! Most of these tips ring true for greening up spaces in other parts of your home, too. Start a conversation with us today for other space-specific tips! !